Reviving the thread with an update. I tried going the Spectre route. All of the auto chain shops have them it seems(other than Advanced Auto Parts). Anyways, got the filter but no flipping adapter to make the filter fit to the MAF sensor. You pretty much need a 3 inch outside diameter tubing to fit on to the inside of the Spectre filter and that should also fit on the outside of the MAF sensor(which I have not tried since I couldn't find the tubing). Anyways, I was at Autozone and found a steel mesh cone filter? It comes with the correct parts and has a silicone tube with and inside diameter of about 3". Since it's silicone and comes with clamps, I believe I should be able to clamp outside the MAF sensor and clamp it down tight. Only down side is the crazy orange color(less loud than VIP's though). I'll give an update after I install it tomorrow. Hey Oxy, I actually have another question regarding the air flow meter you used. If I'm reading my sources right, air flow meters measure the rate of air flow and not necessarily the volume of air flow correct? Basically the MAF sensor will measure the air coming in and inject the right amount of fuel. My question is, a less restricted air flow mod(whether a CAI or less restricted tubing/filter setup) will only allow a higher fuel burn rate(thus theoretically increasing power). In other words, it does squat for fuel economy, but theoretically increase power. So unless you're pushing it harder, there should be no other changes. Correct? looks good. i like the orange. seems like a pretty straightforward diy job. what's the cone filter's model number and price? Anyone do the VIP intake yet? is it really necessary to run a tube to where the stock air hole is? Which tube are you talking about? The stock one from the hole near the grill to the stock muffler? I took mine off when I did my open cone filter. And what do you mean by "kills the sound"? Gets louder or softer? As long as you removed the stock muffler, it should be louder. I have the K&N and it's really really noisy without the air tube to the front air hole. The main reason for the air tube is to get cold air (which is denser) rather than picking up hot air from around the engine. The ECU will mix in extra fuel and you should get a bit of extra power. I think I can tell the difference when the air tube falls off the cone section. 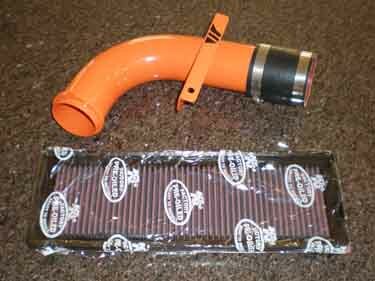 If you have an open cone air filter, using the tube to the front of the grill makes little sense. However, if the cone filter is closed in a housing, then yes, I would recommend keeping the hose. Either way, the hose really restricts air flow when compared to just open air. Which mine is. Incidentally, I notice on the Out Motoring page there are now 2 K&N CAIs - looks like one now has a hose designed by adults rather than the stretchy-concertina-thing that keeps falling off. Looks to have a properly-shaped piece for the opening behind the grill too. ...the hose really restricts air flow when compared to just open air. Hmm - I guess so. (And the opening behind the grill is smaller diameter than the hose, so that limits it even more.) I'm getting out of my depth though - what's more important, quantity of air or temperature (ie density) of air? I can confirm the open cone is seriously loud. Much better with the cold air tube. Also, without the tube, you have a HAI because the air has come through the radiator and around the hot engine before it gets to the intake. The sweet spot for the coolest air with the least restriction is behind and below the block and requires pulling the intake manifold to be able install the cone filter. I'm impressed with the effort you went to to mount it there! I gave the VipAir2 a good test over the past two days. There is a lot more responce when you step on the gas, even between 2K & 3K. When you pass through 3K it actually jumps. I have several long grades that I go up almost daily and I find I can now hold sixth and not have to shift to fifth half way up. I have been taking the same route over and over getting 42+ mpg like clock work. The last two trips got 46+ mpg. This is a combination city and back road. Car idles smoother, the sound is just perfect and any louder would not be as pleasing, IMHO. I did not think this car could be any more fun to drive, but, for me, this mod has made it so. I highly recommend this for you Non-S folks. I have a 2 1/2" to 3" adapter hose fittted to the MAF sensor connected to an 18" Polished Aluminum 3" intake pipe, with an RS Akimoto (K&N) cone filter on the end, using the 10 mm bolt location on the right side of the block as an anchor point for the bracket that keeps it all in place. I used stainless steel hose clamps on all connections. Works great! Very similar to oxy blue coops original set up. I kept the air ram tube from the bumper cowl up to where the air box/baffle chamber used to be to move more cold air into the engine bay. I have pictures, not sure how to post them. Send me PM and I can send them to you, if interested. A lot louder on acceleration and almost sounds like it has an open exhaust---it's amazing how much noise canceling is engineered into a factory air box and baffle. I'll bet your neighbors love to hear you coming . After reading all the post I decided to take the plunge and try my hand at a CAI for my Clubman. Thanks to all who have posted on this subject especially OXYBLUECOOP. I decided to go to the front of the car with the inlet as that is where I found the coolest temps in the engine compartment (thought about a lot of other spots such as the fender wells but was concerned about air quality). I can experiment in the future with the inlet location as the bend out of the filter could easily be turned down to get to locations similar to OXYBLUECOOP's. I went with the K&N Apollo, it was designed in Europe for small engine applications -- Good flow qualities and it is enclosed (insulated from heat). WOW! That's some nice work. Might I recommend an oil catch canister to top everything off. You'd be surprised how much oil comes through that hose and makes it's way to the intake runners. I ordered the complete K&N kit this week so it should be here in a few days. I'll let everyone know how it goes once it's here and installed.